Fine gemstones have been collected and cherished by individuals around the world for centuries. They are commonly used to adorn jewelry, but they may also be purchased as an investment. Some are handed down from generation to generation as family heirlooms. The padparadscha sapphire has exquisite beauty, and its unique look and rareness add to its value and desirability. In fact, this is one of the more expensive types of gemstones in the world. Let’s find out more about it! The padparadscha sapphire has an incredibly clear opacity that makes the gemstone sparkle and shine in even low light environments. It also has a unique color that is not present with other gemstones, and it can only be found in very specific regions of the world. The word padparadscha is Sinhalese, and it means aquatic lotus blossom. One look at the gemstone will tell you that this descriptive word is very accurate and fitting. The rarity of this type of sapphire makes it highly coveted. A one-carat padparadscha sapphire may sell for approximately $50,000 U.S. dollars. However, gemologists often debate what colors should determine value with this gem as well as the location or origin of these gems. For example, some believe that the term padparadscha sapphire can only describe gems that are mined in Sri Lanka. However, similar gemstones have been found in a handful of other locations in the region as well. As you can see, there is considerable variation and debate regarding what a padparadscha sapphire is. However, the majority of gemologists may agree that this type of rare gem has these specific qualities. Alternative Names: Padma ranga, which is Sanskrit for colored lotus flower. Varieties: Variations based on origin (Sri Lanka, Vietnam and East Africa) as well as based on natural, treated and artificial varieties. Hardness: 9 on the Mohs Hardness Scale. Luster: Glassy or vitreous luster. Color: Typically range between orange and pink hues. Zodiac: This gemstone is aligned with the Libra zodiac sign. It is used for September birthdays, and it is related to the planet Venus. The padparadscha sapphire is one of the more unique types of gemstones in the world. Like all sapphires, it is made from the mineral corundum, which is a type of aluminum oxide. While sapphires can be found in a wide range of colors, blue is the most common color that is associated with sapphires. The only color that sapphires cannot be is pure red, and this is because a red corundum is classified as being a ruby. The coloring of the padparadscha sapphire, however, may exhibit warm tones that include deep oranges and pinks. In fact, the coloring of this gemstone is often described as mimicking a sunset or a fire. Because oranges and pinks are closely associated with the color red, there is often some debate regarding the exact hue that a padparadscha can be. The most desirable coloring for the padparadscha gemstone is one with moderate color saturation. Because this gemstone has a vitreous luster, many prefer for the light to shine clearly through rather than to be blocked by a deep, rich color. This is different than what you will find with most colored gemstones. With most colored gemstones, more value is associated with a deeper, richer color. Orange sapphires, including the padparadscha sapphire, activate the Sacral Chakra, the fountain of creativity and the seat of one’s sexual energy. They are solar stones, providing physical comfort and warmth to the wearer. They are connected to the the planet of action, Mars, imparting vitality as well as sense of purpose. What’s more, padparadschas allow us to overcome all obstacles in our lives, moving forward with endeavors. The padparadscha sapphire is an empowering gem for artists, singers, writers, and all other individuals looking to express their creative side. This is because they facilitate Divine inspiration and bring one’s vision into manifestation. Furthermore, they exude life-force and increasing fertility. Many gemstones are featured in prized or famous jewelry pieces. The padparadscha sapphire made headlines in New York City on June 7, 2005. At Christie’s, a 20.84-carat padparadscha sapphire was sold for $374,400. This gemstone was featured in a ring that was mounted by Henry Dunay. With a price equivalent to $18,000 per carat, you might think that the buyer would understand how to value this type of sapphire before making such a substantial financial investment. However, this sale made headlines in part because it was evidence of the misconception and debate over how these stones are valued. Many state that the coloring in this ring indicates that it is not a true padparadscha sapphire as defined by LMHC laboratories because its coloring falls outside the accepted coloring of this type of gemstone. Where Can We Find the Padparadscha Sapphire? As mentioned, there is some debate regarding whether the term padparadscha sapphires should be used to describe gemstones from a certain region only or whether they should describe all gemstones that exhibit the physical characteristics of peachy orange to salmon pink-hued corundum. All agree that this gemstone is derived from Sri Lanka. Some also include gemstones mined in Tanzania, Madagascar and Burma in this description. Because of how rare the padparadscha sapphire is, huge mining operations for this material are not common. Instead, local villagers often look for these gemstones, and the select few who are lucky enough to find one can entirely transform their life. This is because the incredible value of even a single stone can have life-changing effects on poor villagers in these areas of the world. In some areas, people pan the the gemstones in rivers and streams. In other areas, deep pits are dug out so that villagers can excavate the gemstones from the soil. While the padparadscha sapphire may not be a common type of stone, it nonetheless has incredible value and appeal to many. The high price of even a small padparadscha sapphire may make this an unaffordable gemstone for the masses. Nonetheless, this gemstone also draws very wealthy individuals to it. Because of its rarity, it is unlikely that the demand for and cost of this gemstone will decline significantly in the future unless many new gemstones are located in a new area of the world to increase its supply and availability. 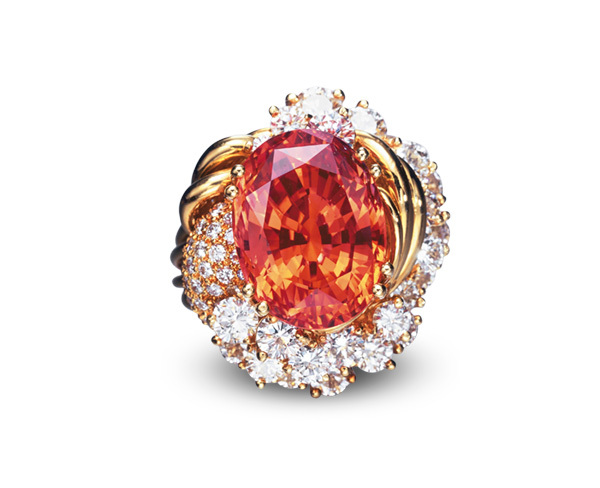 Hey Buddy!, I found this information for you: "Padparadscha Sapphire: A Majestic Gemstone Dressed in Orange". Here is the website link: https://accessgems.com/padparadscha-sapphire/. Thank you.